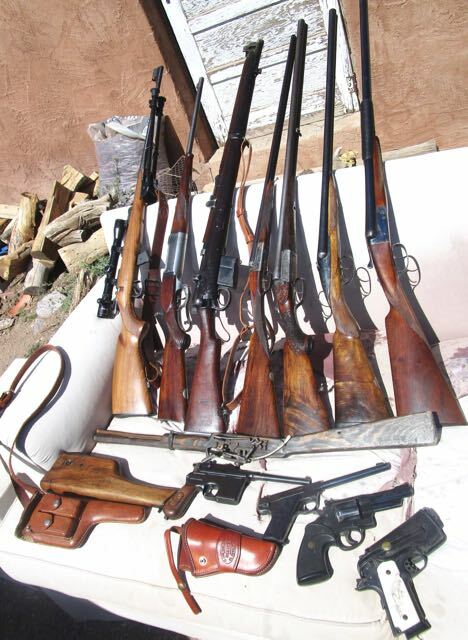 Since my Parkinson's I have been left with a very small collection of interesting guns. It is more a scholarly or utilitarian collection than a pretentious one. A few are on lifetime loan rather than owned. Together there are enough he I can shoot anything from bad people to delicious birds before I die. There are quite enough for anyone. 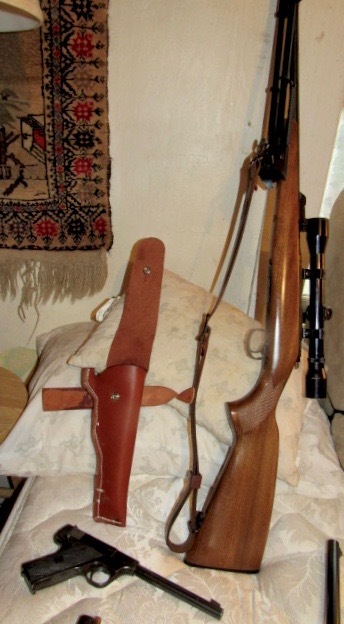 Czech Mauser .22 military trainer, beechwood stock, milspec sights, bolt action It is the one owned by every hunter in Central Asia that I know. 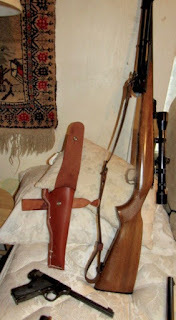 Second: Savage model 99, takedown, made in 1914 and restored by John Besse. Three: an Ishapoor SMLE. Made in 1950 by the Indian government to correct the one fault of the SMLE, the .303 cartridge. This one is in .308, painted black, and I have a ton of ammo for it. Four: My Best quality .410 by Turner of England. Five: "The Cuckoo Clock", a 16 gauge gun made in Austria in 1916 with more animals on it than any menagerie, lent to me by David Zincavage. It is as fine as any English gun, but looks odd to the eyes of any non-German. Six: a Darne 16 made in 1893. This was a project gun that John Besse and I rebuilt almost from scratch. John built a bluing tank to cold- blacken the barrels, fashioned a nickel into an initial plate, and put in a leather recoil pad and an ebony fore- end tip. I refinished the stock. The only outside work was by Doug Turnbull, for case colors. 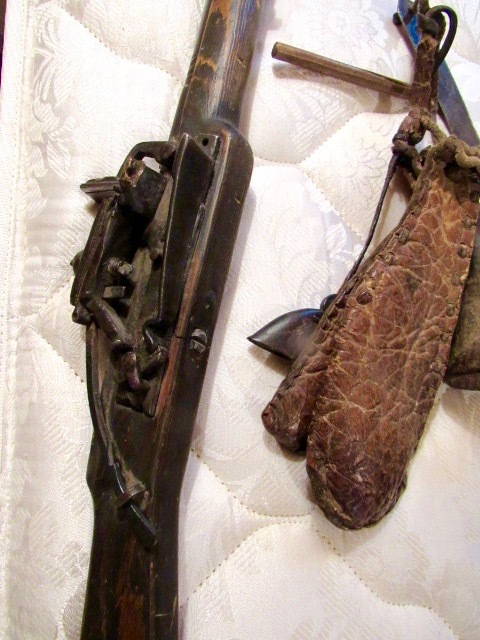 Last in that row: a plain grade Ugartechea 12 gauge, obtained by John as a "utility English boxlock"so to speak. Across the frame: a Mongol snaphaunce, a working gun made by a blacksmith in Bayaan Olgii in 1950. 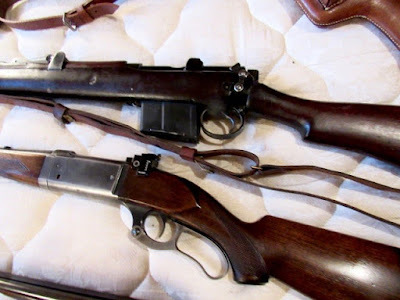 Broomhandle Mauser with all the bells and whistles; nice western- style holster for the Smith, by Old El Paso; Hi-standard target pistol from the 1920's , which John insists is a better gun than the Colt Woodsman. John got 15 and built two "good" ones from them. Next, Smith and Wesson .357 magnum Trooper model that belongs to Dusty Druse, who has it on loan to me but is not giving it up. I don't blame him; it is the nicest Smite, with the smoothest action I have ever kept. Last, all steel compact 1911, much modified from a Philippine forging, with Gos scrimshaw, cocked and locked as always, "to shoot bad people.."
Nate Fitch did profiles of the .410 and the snaphaunce for Guns International magazine. Nate: I've got plenty on my plate at the moment. How would you like to do profiles of several of these guns? I'd like to see the Czech .22, the Model .99, the Ishapoor SMLE; the Cuckoo clock, mainly about German style; the Darne; the Broomie; and the State Trooper.